It’s finally becoming a thing one cannot avoid. Even those who are tired of reading about, or hearing stories about, sexual abuse allegations, even they will simply have to accept that #TimesUp is real, it’s unstoppable, and those of us that found it difficult to talk about the stuff that matters are slowly starting to realise it’s OK to speak our truth. I watched Scarlett Johansson’s speech from the Times Up march in LA earlier this year. Once was not enough! I had to watch it twice. It’s clear she thought long and hard about the words she was going to use and the feelings this movement and her involvement in it represent. And as Ms. Johansson stated, It’s true that for so many centuries women have been taught to be polite, to please and to pander. Becoming victims of this condition become the social norm. Gender equality must exist within ourselves and we must take responsibility for our actions and for ourselves. 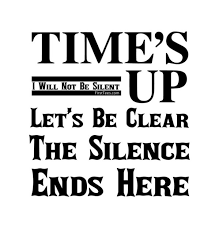 It’s unclear how this #TimesUp movement along with the #MeToo movement will turn out but what is crystal clear, at least to me, is that there is change. People are finally having those tough conversations. The key is that people are thinking about it, even those who are sick of hearing about it.